Easy Living Low-Carb Cooking Cover Price: 14.99 - Sale Price: $7.49 Front and/or Back Cover may have slight scuff marks but all recipes and rest of cookbook intack. Have you ever been frustrated by a lack of inspiration when needing to prepare a realistic, convenient, low carbohydrate meal that your whole family will enjoy? 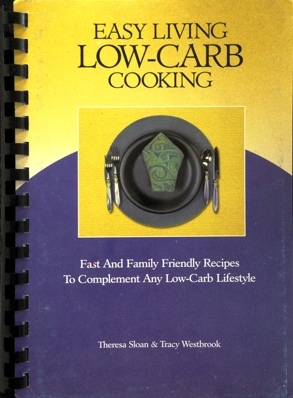 Easy Living Low-Carb Cooking is your answer. Written by two busy working wifes/mothers, this book includes over 100 recipes as well as helpful hints and tips, sample menus, and personal experiences to help make your low carb eating plan (regardless of which program you follow) as successful as possible. Each recipe (as prepared) contains from 0 to 6 grams of carbohydrates per serving, making every recipe suitable for the strictest, initial levels of your eating program. But, even when you are maintaining your weight loss, you will want to continue preparing such delicious dishes as: * Fried Cheese Sticks * Grilled Chicken Salad * Fajitas * Breaded Pork Chops * Meat Pan Gravy * Chiles Rellenos Casserole * Vanilla Ice Cream * and much, much, more! Easy Living Low-Carb Cooking is the first book to be published by CarbSmart - your smart choice for a low carb lifestyle.